So, how YOU doin'? Come on, fess up, how are your NCAA pools going? You either bet a few quid on it in your office or with a group of friends or you went on one of the sites and filed out a bracket, just so you said you had one. 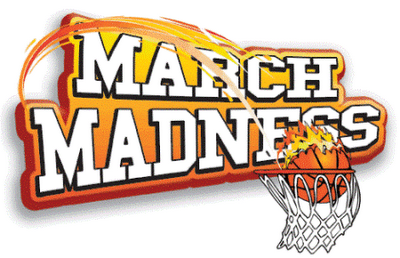 The world fills out a bracket in March for the madness. This year I had 4. Pool # 1 was Jay and Doc's Blog and Twitter League. No cash value, just for fun. Bad news is that I did the pool on cbssports where it was last year. Except this year they moved it to Yahoo! Good news is one other person did the same thing and I am ahead of them(barely) by three points, but my overall pick, Georgetown is out of the dance... BIG LOSER! Pool #2 is with my company. People from all the offices could enter. No cash value, just for fun. I am in 25th spot out of 76 participants with 31 correct and the eventual winner San Diego State still in it. Not too shabby. Pool #3 is one with my client and the agency. I am 12th out of 15 people with 25 correct, but eventual champ Texas is out. LOSER. Pool #4 is a pool that benefits my son's high school baseball team and is pretty competitive. I have placed in the top 10 a few times. This year I am 24th out of 126 places with eventual champ Villanova eliminated. All if these pools have one thing in common other than they range from mediocre to horrible in their prognostication. That one thing is I did not make one pick on these brackets. AccuScore simulates every possible pairing to determine the exact probability each team has of beating every other team in the tournament. Each time you simulate the tournament you will get a slightly or very different picture of what might happen. For example, if Syracuse has a 96% chance of winning their first round match-up, a vast majority of simulations will have Syracuse advancing, but once every 25 times or so you will see a major simulated upset. I had heard this on the local sports radio and decided to see what would happen. As I was in four pools I thought it would be a good representation. When it populates each round it does point out where they might have predicted an upset. You can change that if you care to, but I did not. I let "the 'puter do it..."
So I did the Bracketcaster four times. I even logged out of the site before each new attempt, though I am not sure if they track by ip and it is a return visit. None the less, those are the results that this site came up with for my four brackets. From the Pacific Northwest comes the soulful blues sounds of the Lucy Hammond Band. Ms. Hammond will join me on The Couch to discuss her early life where she began performing at the age of 6. Lucy was a force on the Portland music scene in the 80's before 'retiring' to have a family. Now back and singing the blues we will discuss her upcoming EP "Proof" and the road she is taking to get it released. I will also sit with JP Corwyn, an alternative rocker with a taste for acoustic rock. Born with a degenerative condition, he has been legally blind since birth. He declared he wanted to be a musician at age 5 and has fulfilled that dream now having released two albums and an EP. A native Long Islander, JP now lives in Seminole, Florida. We will listen to cuts from his 2010 release "The White Cane Conspiracy" and discuss where JP is heading in 2011. Join me as I sit with Lucy and JP and introduce y'all to musicians you should know. So a computer can win Jeopardy but it can't pick a decent bracket eh? They don't call it madness for nothing. I hope no one is using Accuscore to pick stocks for their retirement fund. I picked The Beatles...and they won!! I don't know enough about baseball (or whatever) to pick. I just felt like posting a comment. Wish your show wasn't on so late for me. Still, I enjoy the archives when I can.